A hop, skip and a jump away from South Kensington Station sits Brasserie Gustave and how I wished I lived just around the corner because here is a charming French restaurant that will whisk you right to the streets of Paris and make London feel many miles away. Brasserie Gustave is unquestionably a labour of love. General Manager and ex-sommelier Richard Weiss glides around the room meeting and greeting each and every table with a cheeky, knowing grin. His infectious character had everybody smiling and we could tell we were in for a treat. Inside the restaurant it was all about keeping true to le tradition. Simple leather seating, tuck at the corner menus and pictures of la vie Parisienne hung on the walls while the menu presented us with all that should be expected of a traditional French brasserie. No frills, no fuss, just mighty fine food. We sipped on tall glasses of champagne as, much to our delight, Richard appeared brandishing his Champagne saber and decorked another bottle of bubbles with one fell swoop and a style that suggested he had been born with it in his hand. How often does one get to experience such a display of prowess over dinner? We quickly agreed that Champagne sabers are a totally necessary part of every self respecting household. Watch this space, I will have my sword! A bag of crusty french bread assisted our perusal of the menu. The elements that frequently draw me to a restaurant were nowhere to be seen: no sharing plates, no weird and unpronounceable ingredients and no crazy decoration. I didn't care a single iota. Putting aside my usual penchant for the unconventional and letting my need for novelty dissipate into nothingness, it was time to relax and unwind in the uncomplicated calm of traditional French cuisine. There was something about the stress-free 'you know what you're going to get' style of menu that spread the air of relaxation over the room. Richard, with his charm, attentiveness and confidence could have served me a plate of concrete and I'd have been happy. (Slight exaggeration but let's move on). Luckily for our dental hygiene, we chose slightly more teeth appropriate dishes. The smoked salmon arrived in an entertainingly circular arrangement. The child in me almost cut eyes and a smile but since I knew I was going to want to return, it was decided that I should hold back on the infantile artistry in this instance. The moules marinieres swam in a deliciously creamy white wine sauce and produced the kind of delighted groans that resulted in curious glances from surrounding diners and then a barrage of food envy! Named after Gustave Eiffel, the architect of that big tall thing in Paris, our cloakroom ticket was firmly attached to a little model which sat with us on the table and made sure we didn't forget Brasserie Gustave's roots. For our mains, it was onto confit de carnard married with carrots and pickled white cabbage and boeuf bourguignon with mashed potato. Both dishes were outstanding, cooked with the simplicity and respect for which the French are renowned. We just about maintained composure and concluded that it is indeed socially unacceptable to bury one's head in the bowl as much as we wanted to finish every last morsel. Some of the dishes had a little more show attached and were wheeled out on a trolley but Richard nonchalantly flipped and swished while he rustled up Crepes Suzette as if he was just chillin' in his kitchen. I think we might just all need a Richard to chill in our kitchens! Totally stuffed and with no space for dessert, we decided to order dessert. It had to be the creme brulee. Its caramelised surface did the spoon cracky thing that ticks the brulee box and the sweet creme was silky and light and just how it should be. On a little explore mission, I discovered the downstairs bar where you could perch if you fancy a spot o absinthe pre dinner and a private dining room where you can really feel like you're at your home away from home. Brasserie Gustave is fuss-free (minus the price, pocket extensions may well be required) and fabulous. We left the restaurant draped in an air of sophistication and in that slightly stupefied daze which comes from being truly satisfied. Hats off to Chef Laurence Glayzer who arrives with The Ritz, Harry's Bar, Browns Hotel and The Arch under his belt. The food wasn't revolutionary, but that wasn't the point. 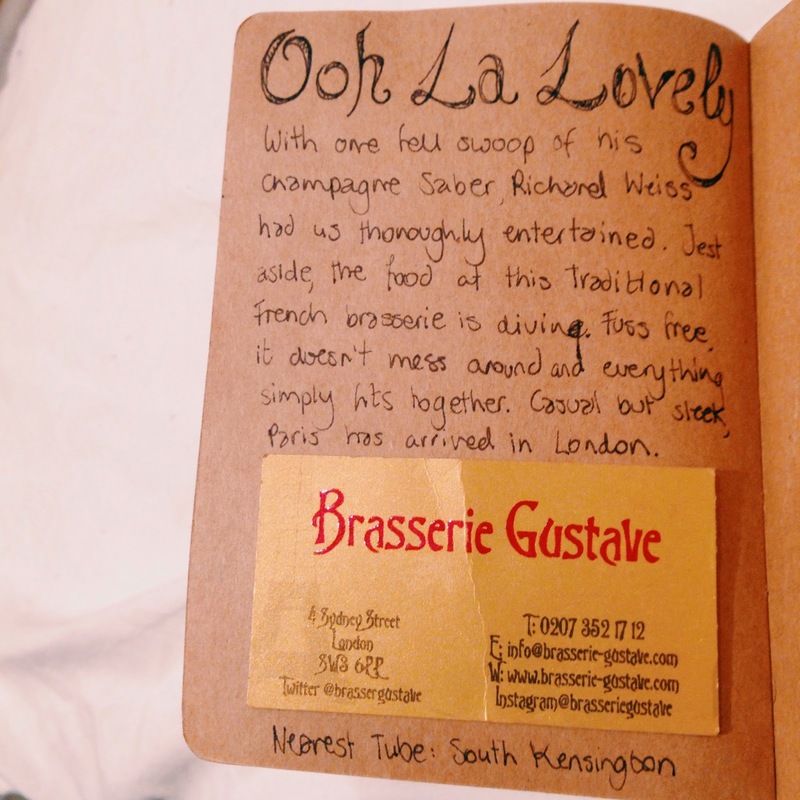 Every mouthful was superb and we couldn't have been happier that London has it's very own authentic taste of Paris. I was invited by Brasserie Gustave for a late gift from Santa .. Santa was very good to us indeed! Thanks, so glad you like it..lots of interesting places coming up! Just checked yours out too, lovely concept and the passion really shows!